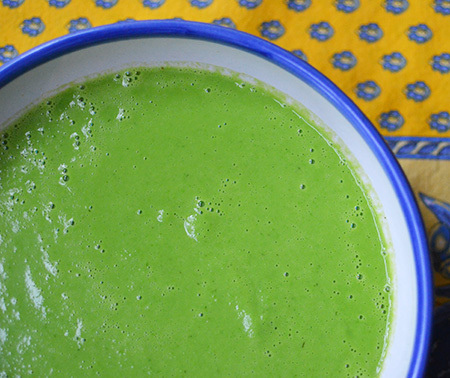 When someone mentions pea green, most people think of pea soup made from dried peas. Army green, hospital green, schoolroom green. Tasty, yes, but not a color that inspires me. 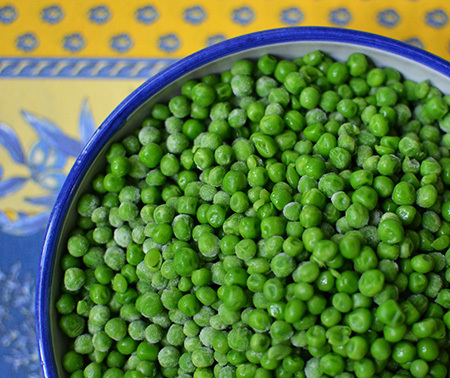 I prefer bright spring green, which can be brought to your table with vibrant fresh – or, in this case, flash frozen - peas. One evening, our friend Marie-Claire came to dinner to help us taste a few rosés. It was the night I made the Parfait of Sweetbreads. The sweetbread appetizer was unbelievably rich, so I wanted to create a light main course. Channeling Henri, I thought about flavor, color, texture, and composition. Here is what came to mind ... peas, lemon, fennel, and some nice, plump sea scallops. It all came together in a flash. The one ingredient that really made the whole dish was the garnish of diced Moroccan preserved lemon. 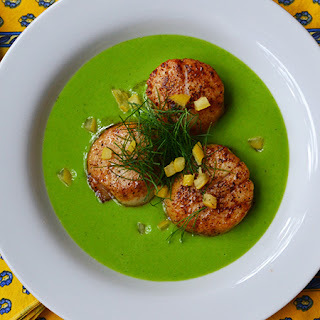 The brightness of lemon was perfect with the sweet fennel and pea purée and the briny seared scallops. Amazing color, texture, and flavor; Matisse would be proud! He might even have approved of my plating! 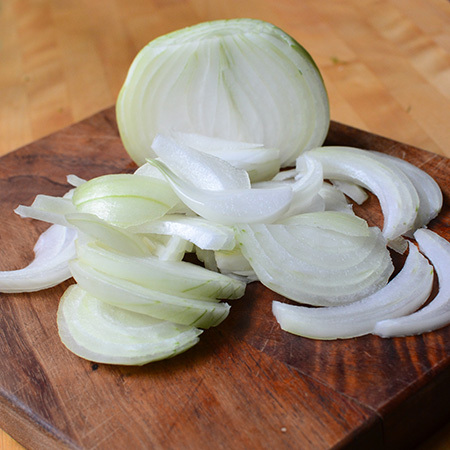 Heat 4 tablespoons butter in a soup kettle over medium heat and add the onions and fennel bulb. Cook gently until both are soft and translucent; do not brown them. Add the peas and 4 cups broth, bring to a boil. 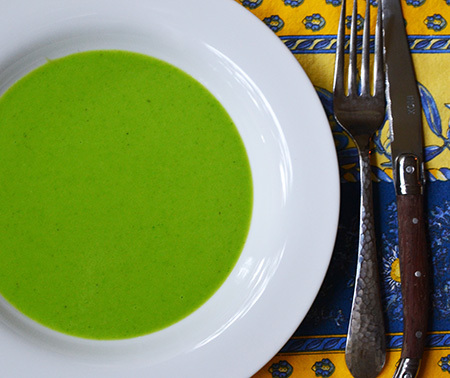 Reduce heat and simmer until peas are tender. Transfer the peas, onion, fennel, and broth to the food processor; purée. If too thick, add some more broth. Adjust the seasoning. Clean out the soup kettle. Then, using a very fine mesh sieve, press the pea purée through the sieve back into the soup kettle. 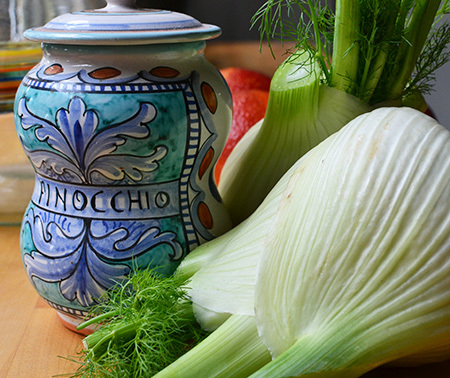 Add the Pastis and stir; set aside. Discard solids in the sieve. Wash and dry the scallops; remove the tough muscle. 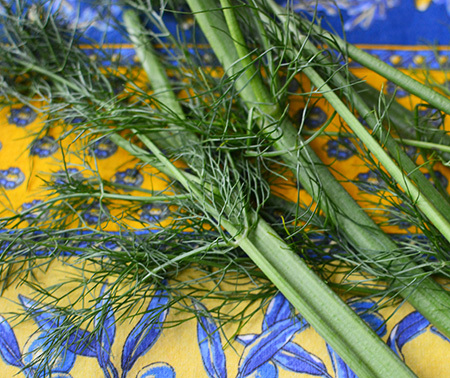 Mix the flour and fennel pollen, with some salt and pepper, on a plate. 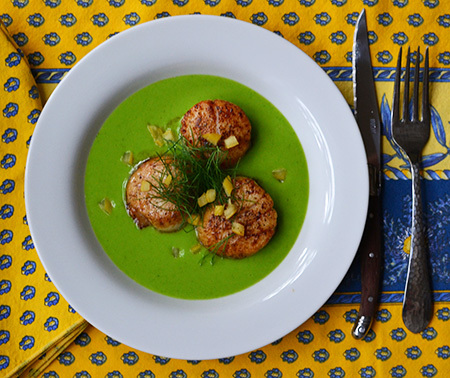 Dredge each scallop on both sides and place on a plate. Over medium-high heat, melt the remaining butter in a large non-stick frying pan. Sear scallops for about one minute on each side. Ladle some pea purée into 4 heated soup plates, add three seared scallops to each plate, and top with chopped fennel fronds and some diced preserved lemon. Light the candles, put on some Édith Piaf to set the mood, and serve with a nice rosé. Sounds delicious! Where does one get Moroccan preserved lemons? Also, I love your suggestion of Édith Piaf and a nice rosé. Sounds delightful! Caroline - thank you for asking. 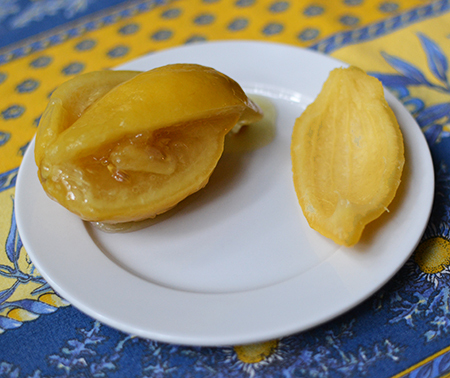 I just added a link to my recipe for "how to make Moroccan preserved lemons!" It's really easy and MUCh better than what you can buy on a store. Wonderful! I'll have to check it out! David, oh my, this looks absolutely delicious. 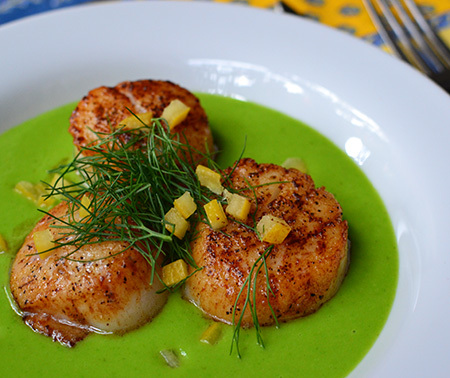 I love scallops and this is just a gorgeous dish! You are so kind, Liz! Ah, that Matisse... he was always getting into something! That colour! Those scallops! I think I feel like dancing around the garden at twilight - with a glass of rosé and a fork holding a scallop, of course. That would be a vision, John - would you paint yourself bleu? I feel like dancing also after eating this colorful meal, I love scallops and that sauce looks exquisite. When you open your restaurant, you must feature this dish. Meanwhile, I must try recreating it! How wonderful that you honeymooned in Morocco! It is such a magical country, and it was there that I, too, fell for those preserved lemons! I hope you are making them at home, Paolo! The green is certainly brilliant and beautiful! And scallops are, of course, always amazing! I am glad that rosé wines are coming back--I have some fond memories from my youth... Sounds like a great evening! I am glad to hear you say that about rosé, Inger. I am glad, too. I had an event here at home for my alma mater, and put out a red, a white, and a rosé - more than half the people went for the rosé! Glad you like the scallop dish! I love the colors. I am sure it is utterly delicious. Thanks, Nazneen - I am not sure what inspired that hint of lemon at the end, but it really made the dish. Why don't I get flashes like this? How can I channel Henri? Not anticipating much success in either of those endeavors, I will happily follow this inspiring recipe! As everyone has written, brilliant colors! Oh, c'mon, Susan! You get flashes - they just may not be Henri-inspired... perhaps some great journalist? Absolutely gorgeous!!! Love your French references! Thanks, Mimi - it is really fun creating dishes like this! What a pretty, pretty dish…a feast for the eyes. I can just imagine how good it was. Thanks, Karen. It was really good - definitely one I will make again! Dear David, just a perfecly presented spring dish with loads of wonderful flavors all coming together for an elegant dinner recipe. It just occured to me that I never made preserved lemons...and I know that I should some day. They are so easy to make, Andrea - you definitely need to try it. And they are so much better than anything you can buy!